Well this week was the latest Doctor Who sale at Bonhams, and on Sunday I went along to the viewing. 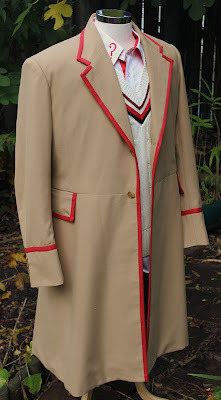 The write-up below features the Fifth Doctor items, and I have written about the other Doctor eras under the appropriate blog. 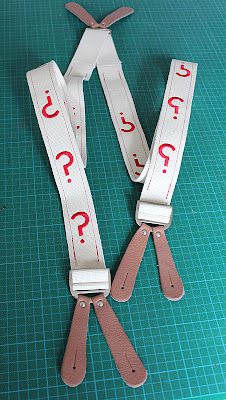 As well as a lot of New Series stuff, there was a good showing of Davison era items too. The ground floor room was given over to the monsters of Doctor Who and on show was a Sea Devil from Warriors Of The Deep (see below, left); two Tractators from Frontios (see below, centre); and the Garm from Terminus (see below, right). The glass cabinets also held a number of Davison era items, including a bust of Mawdryn from Mawdryn Undead (see below, left); a Vanir helmet from Terminus (see below, left); the Ergon’s head from Arc Of Infinity (see below, right). For me though, the prize of the Davison era items in the cabinets was Sharaz Jek’s headmask from The Caves Of Androzani (see right). 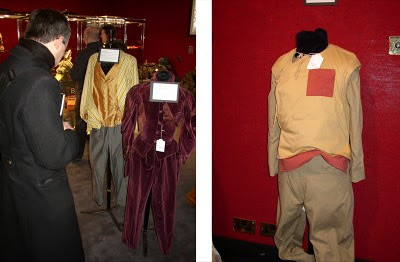 The assistants to Davison’s Doctor were also represented with Nyssa’s costume, as seen from Castrovalva (see below, left); Adric’s tunic (see below, centre); and Turlough’s school uniform (see below, right). Also in the monster room were the Malus from The Awakening, both the small articulated puppet and the enormous face; the Magma Beast from The Caves Of Androzani; three Plasmatons from Time-Flight, all of which were badly deteriorated; two Terileptril costumes from The Visitation, one of which had been adapted for use in Mindwarp; and an Android from The Visitation, which had been very badly damaged by a notorious fire at the Longleat exhibition. After all the headline grabbing of the New Series stuff, such as Kylie’s dress, I am wondering what interest there will be for the old stuff. I’m sure there will be die-hard fans there to bid no matter what.